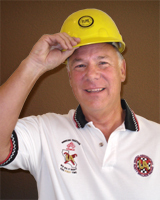 Mr. Reinhardt serves as Program Administrator for the PIPE Contractors Safety Association, Inc.
Mr. Reinhardt is also responsible for all filings required by the WCIRB and DIR. As Program Administrator, he is also responsible for the Selection and Approval of Carrier Participants. If you have any questions regarding the operation or benefits of the P.I.P.E. ADR Group Workers’ Compensation Program, please give Chris R. Reinhardt, CIC a call at (800) 864-6623 from within CA, (909) 234-7290 from outside CA or send an email to: chrisr@unionadr.com. Judge Robyn’s career gives him unique insight into California’s troubled workers’ compensation system and the emerging world of privatized ADR programs for workers’ compensation. He has worked in the political arena, practiced law as a trial attorney, served in California State government as a workers’ compensation judge, and for the last 20+ years, overseen the most successful ADR programs for workers’ compensation in the State of California.